I’ve been working as a freelancer since I was 19. There were definitely breaks in there of unemployment and W-2 employment, but it’s a business model I’ve been familiar with since a relatively young age. I mean, you think you’re familiar with it. But then you find out a new “con” of switching to an LLC. Or realize you forgot to record expenses last month and now have to go back and pour over bank statements. Or you finally recognize that you’re worth more than you are charging. Setting yourself up as a freelancer doesn’t have to be hard, but you should understand that you don’t know what you don’t know. You don’t always know the questions you should be asking, and you need someone to guide you through the process. I feel like very few of us have had that mentor. Instead, we’ve just learned along the way. Bravely Freelancer Guide is that mentor. It was created by Kara Perez from Bravely who is making awesome things happen in the female money space, especially in her hometown of Austin, Texas. Deciding between an LLC and Sole Proprietorship. What you are and aren’t allowed to do as far as banking goes. Why emergency funds are so crucial to freelancers–and how big they should be. How to pitch potential clients. The exciting world of quarterly taxes. How long to hold onto business documents. I learned some new stuff from this guide that I’m going to start implementing. Like I found out there are probably some documents I’m still holding onto that I don’t need anymore. So I’ll clear out some room in my drawers. I’m even reevaluating my pricing structure for my services once again. 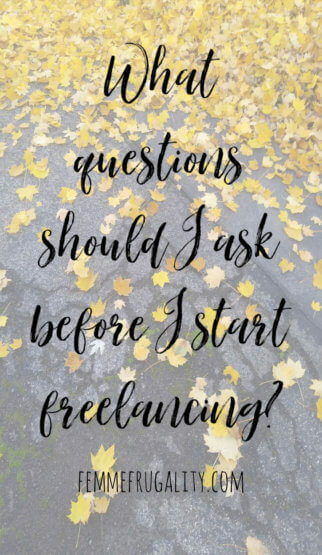 It’s not so much that there’s a lot to know when you start your freelancing journey–it’s moreso that you don’t know which questions you should be asking. But a lot of people get so intimidated by the unknown that they never get started. Kara does a beautiful job of putting those questions and their answers together in a simple, easy-to-digest way. It will help you actually launch your freelancing business without experiencing that overwhelm. Highly recommend checking it out today. Freelancers: What is one question you wish you had asked when you were getting started? This entry was posted in Ways to Make Money on November 16, 2018 by femmefrugality.